A potted history of the Gosport Museum and how the Friends became involved. 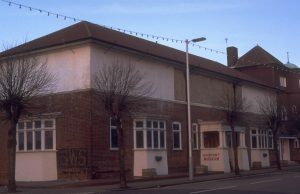 The Gosport Museum was founded in 1975 to record all aspects of the history of Gosport from the earliest times to the present. It was housed, where the old Central Library had been and the Grammar School before that. This is the building in the photograph above. In 1990 Ian Edleman the Curator of the Gosport Museum at that time created the Friends to support the Museum helping with the exhibits and items in the store. The inaugural meeting was held in the Gosport Council Chamber on Monday 22nd October at 7pm for a 7.30pm meeting. This set-up a Steering Committee. After 4 meetings of the Steering Committee, the Founder Members Inaugural Meeting was Monday 20th May 1991. I have been advised that the first membership was paid and membership number issued, 9101 on the 15th March 1991. In 1991 there were 32 members. The current membership is 36 but the hope is a few have not renewed yet as there were 46 by the end of the 2016/17 year. Thank you to David Moore who gave me that information and cleared up a number of questions I had about the past officers and committee. I feel the beginning of The Friends of Gosport Museum was that date. See the lead up and following in the past Newsletters. I hope that you will have time to look up the past and current newsletters . Also the list of Friends of Gosport Museum past and current officers and committee members. I have other records from the Friends past, so please let me know if you think other items could be added to the web site. In 2005 the Museum joined with the Central Library to become part of the new Discovery Centre. Containing displays, graphic panels, computer images and artifact’s continue to tell the story of Gosport. It is housed in the main Discovery Centre building as the Museum-on-the-Mezzanine and now Museum @ Gosport Discovery Centre. The former Museum building opposite the Discovery Centre is now a Local Studies Centre with a wealth of books, maps, photographs and documents. The building also houses the Hampshire Geology Gallery. This is dedicated to David Kemp including fossils which are millions of years old of Hampshire back to the dinosaurs. It also has Monty the woolly mammoth. SEARCH the hands-on museum is in the same building. This contains the 19th and mid 20th century room set (occasional public openings). The Museum as well as the Gosport Gallery and SEARCH are no longer run by Hampshire County Council but since 1st November 2014 by Hampshire Cultural Trust. There are the beginning of plans by the Hampshire Cultural Trust for the future. The Hampshire Cultural Trust can look into how they can be publicized and run. The are currently looking for ideas on how to renew and revitalize the museum.